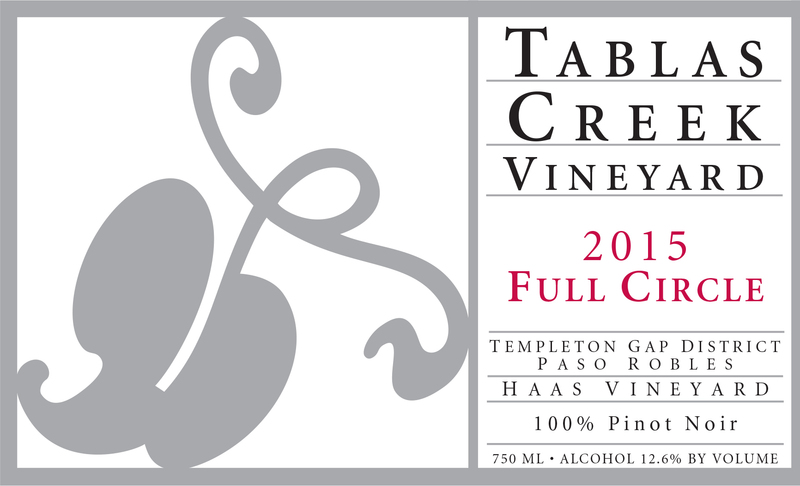 The Tablas Creek Vineyard 2015 Full Circle Pinot Noir is Tablas Creek's sixth bottling of this renowned Burgundy grape from the small vineyard outside Robert Haas's family home in Templeton. We named the wine Full Circle because it reflects his career: from a start introducing America to the greatness of Burgundy, through decades focusing on grapes from the Rhone, he's now growing Pinot at home. The 2015 Full Circle shows shows a dense nose with notes of cherry cola, black tea, and a graphite-like minerality. The mouth is medium-weight, with pie cherry and baking spices, a little thyme-like herbiness, and a lightly tannic finish with nutmeg spice. A wine to break out in front of a fire during the holidays. This Pinot Noir comes from from the 2.5 acre vineyard around founder Robert Haas's house in Templeton. The Templeton Gap has been long recognized for its marine influence and resulting microclimate that is the coolest in the Paso Robles AVA, and the Haas Vineyard is in one of the coolest pockets of Templeton, near Santa Rita Creek. This vineyard is farmed organically by the Tablas Creek Vineyard team. The 2015 vintage saw dramatically reduced yields from the combined effects of four years of drought and cool, unsettled weather during May's flowering. Months alternated between significantly cooler than normal and significantly warmer than normal, which produced an early start to harvest but required multiple passes through most vineyard blocks during a long, drawn-out picking season. Yields on Pinot Noir were down 50%. The result was a vintage with excellent concentration but unusually good acids, and wines with dramatic aromas, texture, and intensity. The Pinot Noir for our Full Circle was harvested on August 22nd. The grapes were fermented in one-ton microfermenters using native yeasts, half destemmed and half with stems included. After pressing, the wine was moved into year-old Marcel Cadet 60-gallon barrels, for a hint of oak. The wine stayed on its lees, stirred occasionally, for a year and a half before being blended and bottled in April 2017.